This activity is highly recommended as a team-building activity! I honestly think that I can now race in Formula One. That's after hitting the mark when the staff waved the checkered flag signalling Finish Line and End of the Game. Let's go kart! The whole experience of Kart Racing yesterday morning was indeed exhilarating, fun and safe. Thank you to City Kart Racing! It is as if we were really in a real race competing with other racers with our scores/stats being updated real time in the LCD screens installed in the place after each lap we completed. The City Kart Racing is temporarily settled in the 7/8F of Park Square One (yeah, Park Square has different way of numbering their floors). 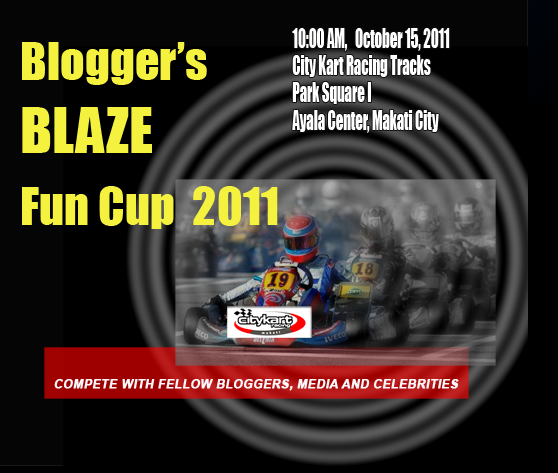 If you are wondering what I was doing in a race track early Saturday morning, I was there for the Bloggers Blaze Race. I made a quick research about the City Kart before the event, and I found out through one of the post that the business has been here since 2006! I am soo glad I went despite lack of sleep. 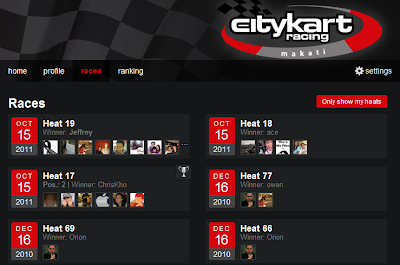 The City Kart Racing was originally set up in Paranaque but is now closer to alot of people (and I can say accessible). They will soon open and transfer to a new site with much exciting tracks complete with humps and bumps, per Jean-Marc Freihuber, owner of City Kart Racing. Let's go to the fun part. Let's race! But first things first - let's register and the briefing. We were asked to register via Facebook. The very nice ladies in the City Kart Racing will assist you on this. 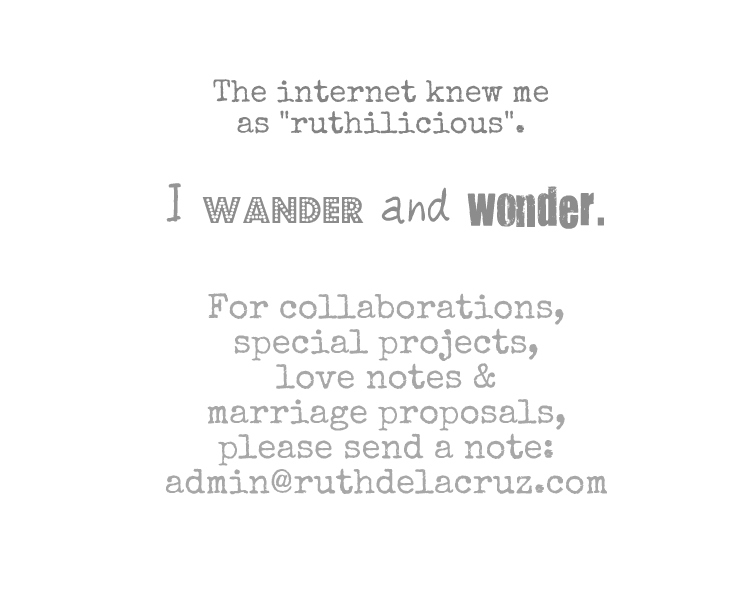 Then of course, the waiver. We were lucky because it was Jean who conducted the briefing. This French guy who has been racing for almost 20 years, has alot of stories and tips to tell. If it is your first time to race (like me), good news! The kart is so easy to use. It's just gas and break. Step hard on gas to speed up, release and step on break to stop. Jean showed us how to properly and not properly handle the steering wheel. The City Kart Team can better explain it, so let's go to the flags. The Blue Flag means there's someone behind you who is faster, so you must give way. That's the only thing you can do. Give way. It's not about racing on who will reach the finish line first but how fast you can do the laps. So just give way. If they start waving it, it means you are being hard-headed. If they throw the blue flag at you, you have an attitude. Yellow means there's a trouble ahead and you may want to slow down if you don't want to add on the trouble, as Jean puts it. I received the flag a couple of times. I was just glad, I never caused any trouble that morning. Then of course, the Checkered Flag which means Finish Line! Jean said that once the winner hits the line, he/she has to finish another lap and wave and enjoy the glory. That's what I call the winning moment! Alright, let's get into business. We were given balaclava for sanitary purposes. We don't want to share sweat with other racers who already wore the helmets. I chose a pink helmet! I was nervous and excited. I have driven an ATV before but this one is different. The least I wanted is to smash my face and break my bones. Jean assured us that he only got the best and safest karts. All machines and even wheels are covered so there's no chance that our elbow, or hair would get tangled, but just for safety, it is best to keep your hair tucked inside the balaclava. Ok, let's start the engine! I was second to leave and I felt it was pretty easy. How cool it is to actually move in a sitting position? Super cool! I just tested the track and even overtook the one who went out first. 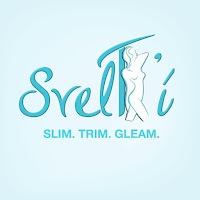 There are curves and as I move ahead, there are alot more curves. I tried speeding up for straight tracks, and I know I could go on faster but I was just afraid I would not be able to control it when reaching the curves. Most of the time I would do full turns when doing complete turns. Other bloggers were waiting in the pit, aiming their cameras and we were like guinea pigs. I wish to take my camera with me while racing, but when they asked us to remove our jewelry, I know they meant safety. I couldn't remember how many laps I had done. I was getting tired and I could feel my arms aching. This was just a test race anyway. When I got the Checkered Flag as a signal - Whew! Thank God I am safe! That's all I could say. 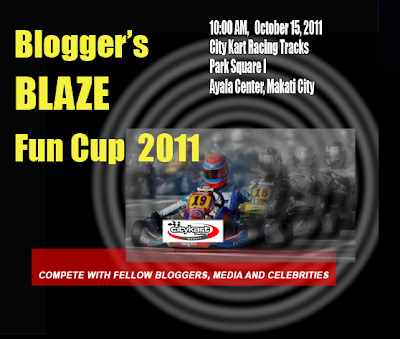 Bloggers kept on telling me I was fast, but I only landed 4th placer at 69,186 seconds. There was even a scoreboard flashing on every LCD monitor in the place and every lap, the names were moving to show each racer's standing. Ack! I could have done better! I want my pic on the screen! You can even see who's driving next.. feeling like a celeb or a racer? Real time, you can see who's leading! Yes, there were even pictures on display and our rankings were even sent to our email addresses and posted in our Facebook wall to let our friends we were racing and brag about our standing. That's automatic update. I am not the type who always update my profile. But the app did it for me. The results were also sent to our email address. I got this on my mail when I got home. The next 2 batches took the test race while we watched and have fun taking pictures of ourselves with the helmet. Can you think of Bioman? In the meantime, we stayed in the Lounge. Then Jean talked about this fab application where you can access to keep posted on the events in City Kart Racing. He told us he was one of the few people who owns this. And that I can say is really amazing. 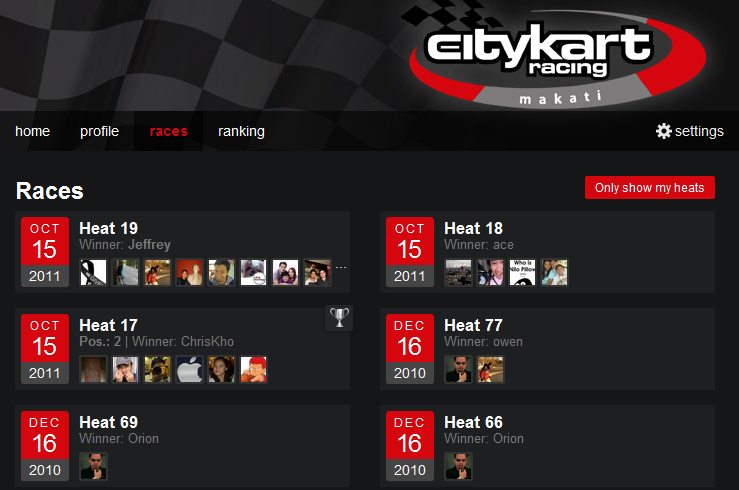 You can check your stats or friends' stats, even people all over the world who were racing real time. You can compare your stats versus your friends' or even with people all over the world. How am I standing against my friends.. am I standing tall still? 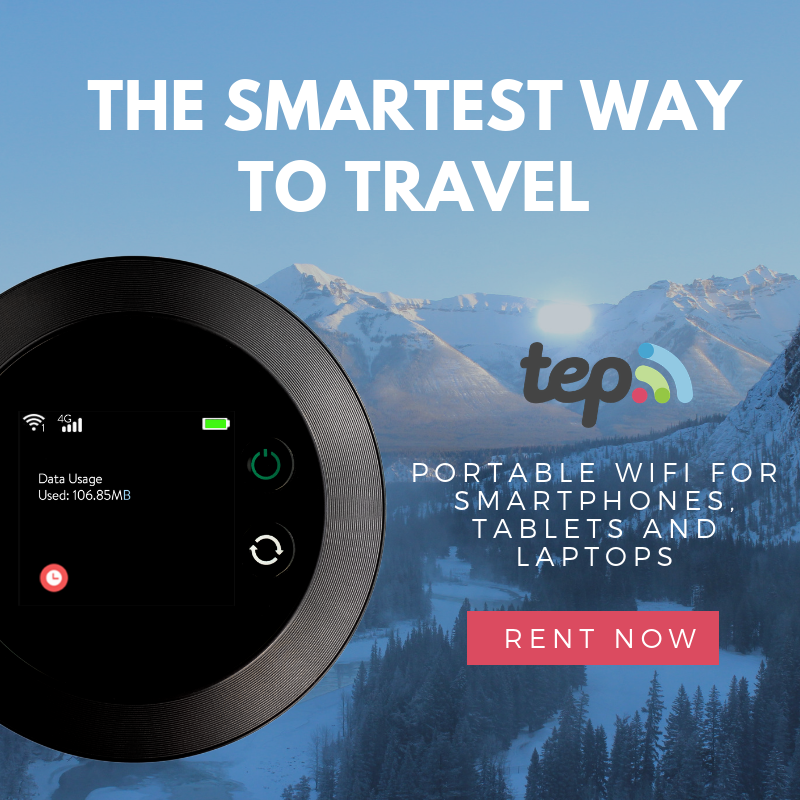 The website is also as cool as the app. 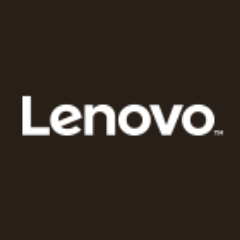 You can view and see live stats and events real time! The true race competition was then announced. Teaming up racers with other racers - the racing ability of each racer was fairly distributed. A team of three members would race for one hour, giving each racer 10 minutes. The goal is to determine the team with most laps completed. It's no longer speed that we are talking about. But doing more laps means driving fast - so teamwork and staying focused should go together. I chose not to race together with Pusakalye and Azrael. Bed was calling me. We said goodbye and thank you to Jean and I promised him that I will be back. It was really a one-of-a-kind exhilarating experience beating my ATV, and coming close to my 4x4 ride experience. What makes it exciting is, it is fun and safe. I feel that I can totally speed up and compete without the fear of machine malfunction. But the bomb is the technology used in City Kart Racing that makes me feel like a real Formula One racer. And that is coming from someone who doesn't know how to drive. I know, we missed the chance of owning the precious trophies.. But we will be back, and hope to see you guys in the Finish Line!